If you are on a lookout for good Greek food then look no further than Labbys The Hellenic House. 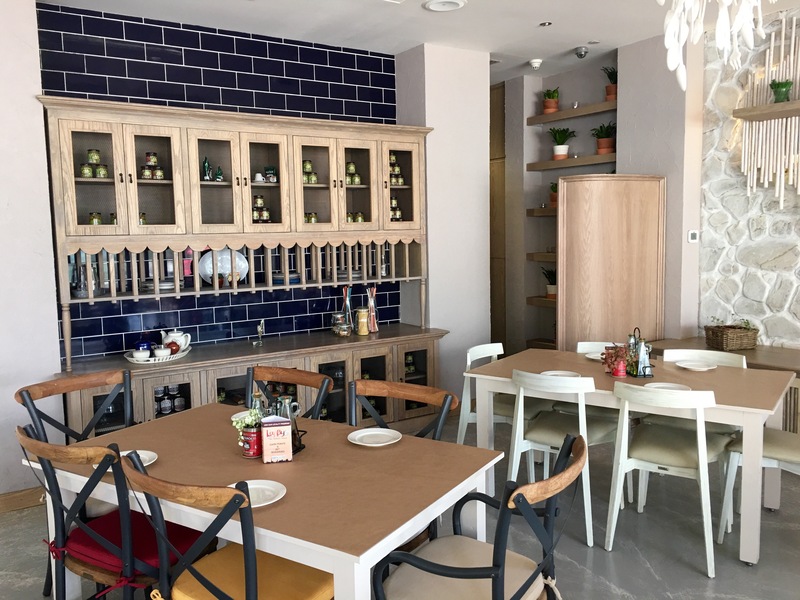 Dubai is home to restaurants offering many kinds of cuisine, but when it comes to Greek cuisine there are very few options. 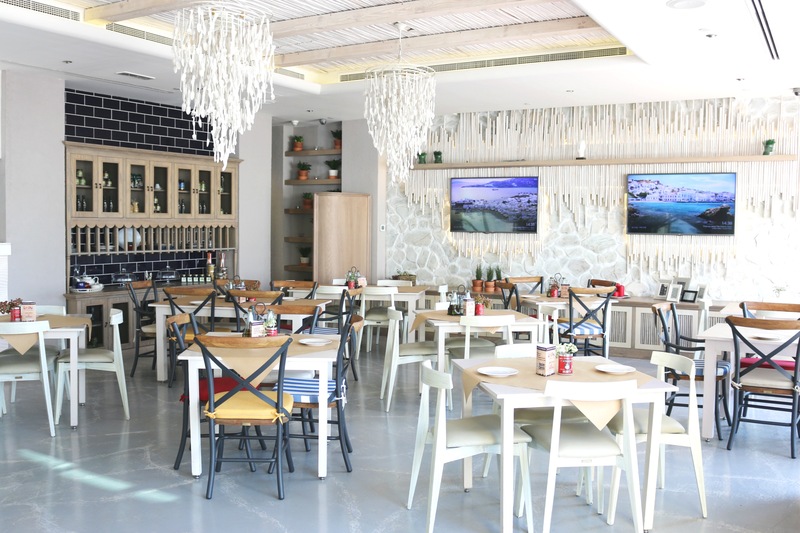 Labbys The Hellenic House is a welcome addition to the Greek cuisine in Dubai. Labbys The Hellenic House is located in Jumeriah Lake Towers or JLT- The foodie Haven, as there are many great restaurant options there. The restaurant is conveniently located and very easily accessible. I went there on a Tuesday afternoon for early lunch. The ambience of the place will transport you to Greece. The whole place is done up in pristine white that gives it a bright and summery look. The setting is rustic yet modern. The interiors are a blend of minimalistic chic and elegance. The whole place is done up tastefully and every small detail is taken into consideration. The menu is simple and covers most of the popular traditional Greek dishes. All their dishes are made using Greek ingredients and cooked with Greek extra virgin olive oil. They also have a Greek chef, so you can expect authentic and fresh Greek food at Labbys The Hellenic House. 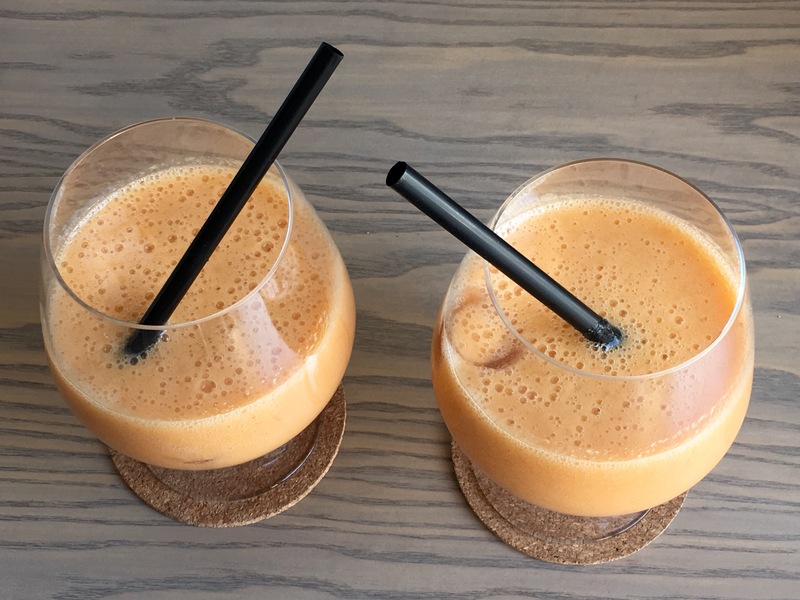 I started off with a refreshing glass of Mixed Fruit Juice. It was a smooth blend of medley of fresh fruits. Apart from fresh juices, they also offer soft drinks, coffee and tea. I missed having the Greek coffee, definitely will have it next time. I tried Greek Traditional Salad, Tzatziki, Kolokythokeftedes, Fried Feta, Spinach Pie and Gyros. 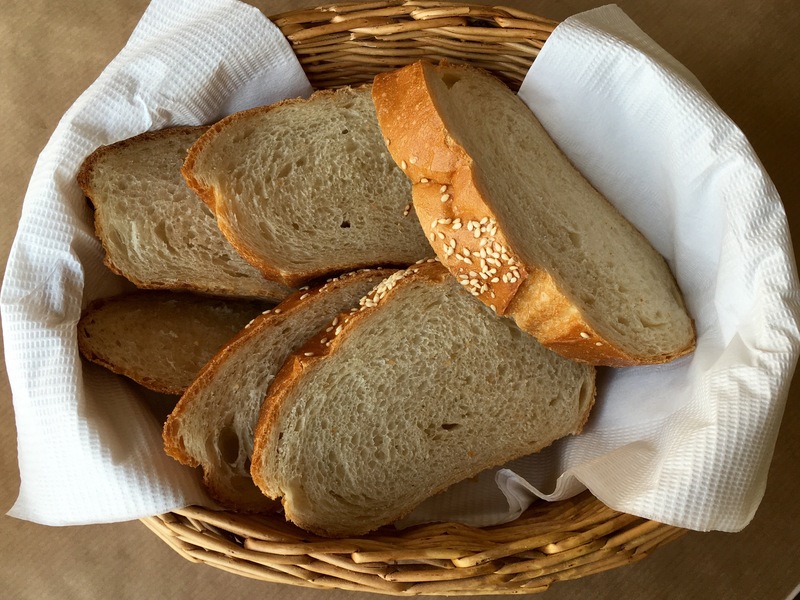 They also serve complimentary Bread that is freshly baked at the restaurant. 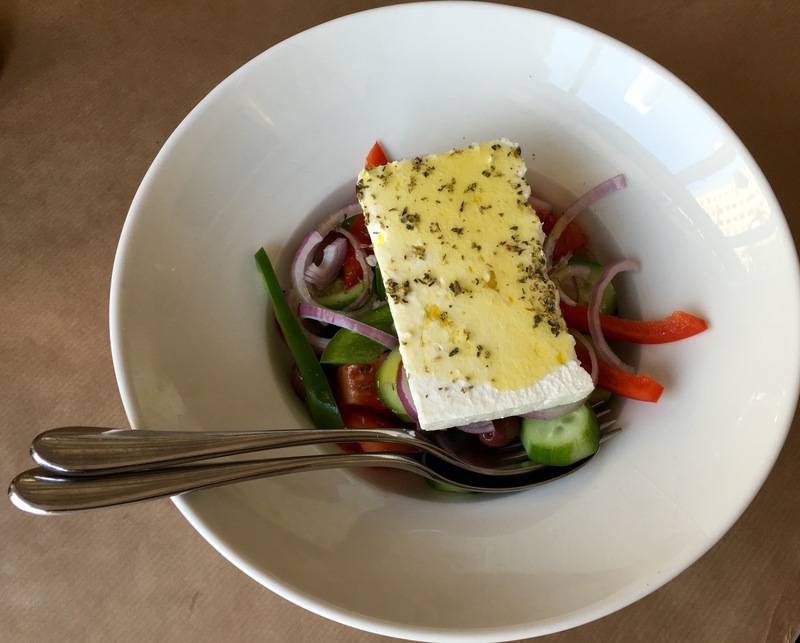 Greek Traditional Salad was made using fresh vegetables and topped with a big slab of feta cheese drizzled with olive oil and oregano. The Greek salad was fresh and crunchy. 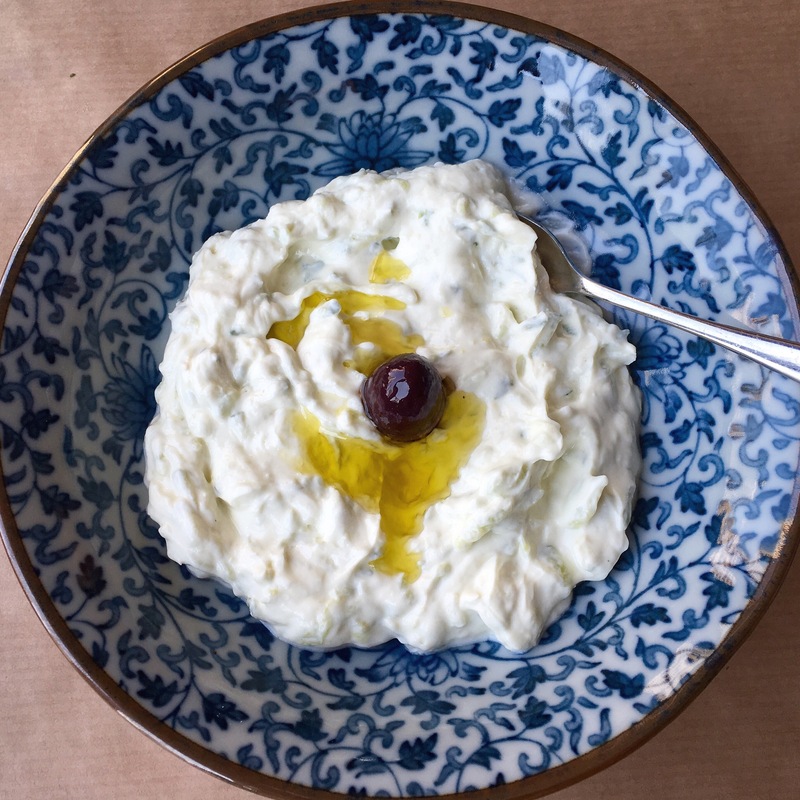 Tzatziki is a traditional Greek dip or a sauce made with yogurt, cucumber, garlic and extra virgin olive oil. It was creamy, light and slightly garlicky. This dip is a definite must-try at Labbys. 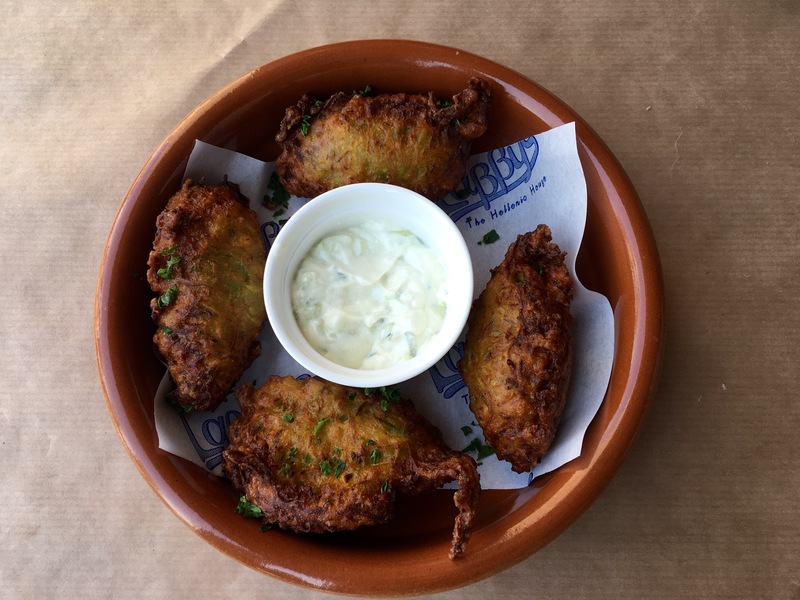 Kolokythokeftedes is the zucchini fritters. It was golden brown in color and crispy from the outside and soft from inside. It was tasty and flavorful with a hint of Greek herbs. Fried Feta at Labbys is sinfully delicious. 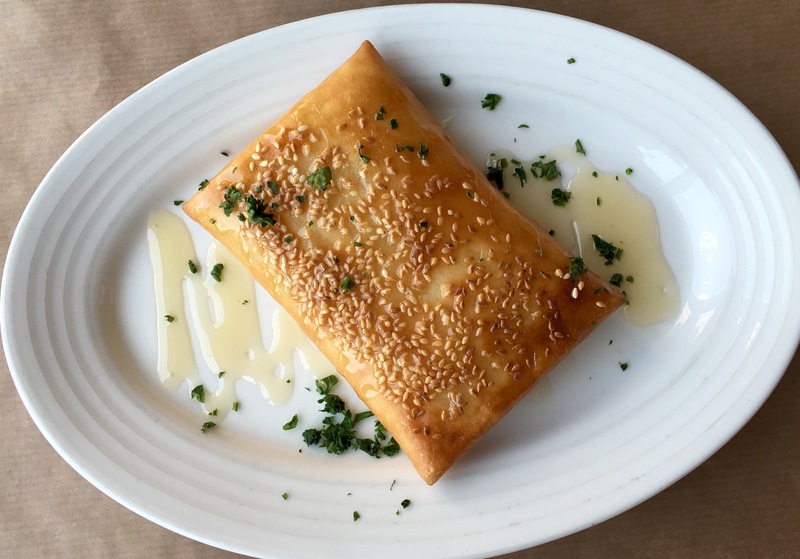 Fried feta is wrapped in pastry and topped with sesame and honey. 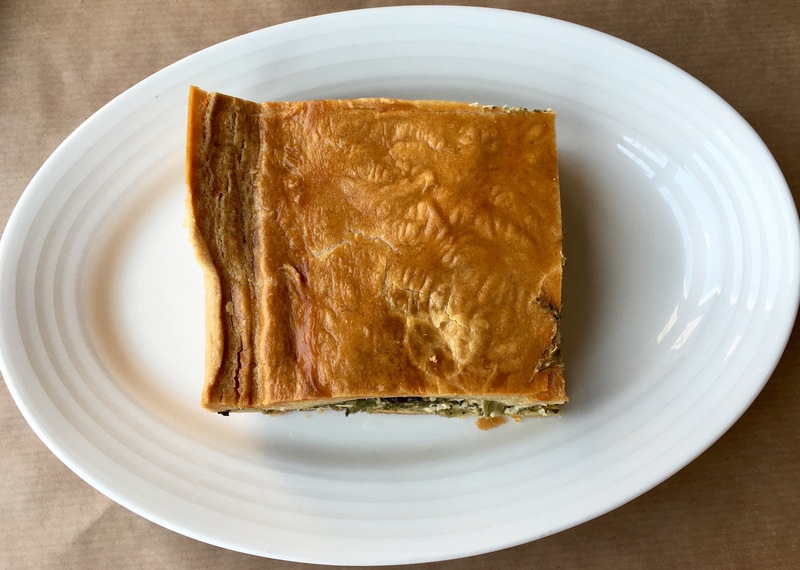 Spinach Pie or Spanakopita is a Greek savory pastry. It had a filling of chopped spinach, feta cheese and onions. It is rich in taste, but can be heavy. 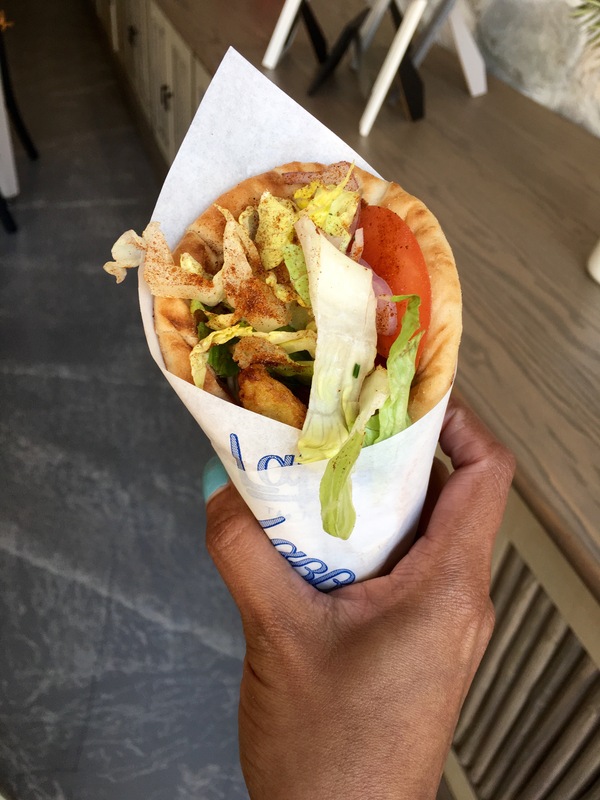 Gyros was served with grilled pita bread rolled up with tomatoes,hand-cut fried potatoes, onions, lettuce and Tzatziki. It was delicious. As I am a vegetarian, I asked them not to add chicken. Vegetarians have plenty of options to choose from salads and cold and hot appetizers. The non vegetarians have the option of Mousaka, Soutzoukakia, Pita Souvlaki and the grill. As for the dessert I had their new dessert Sokolatopita. 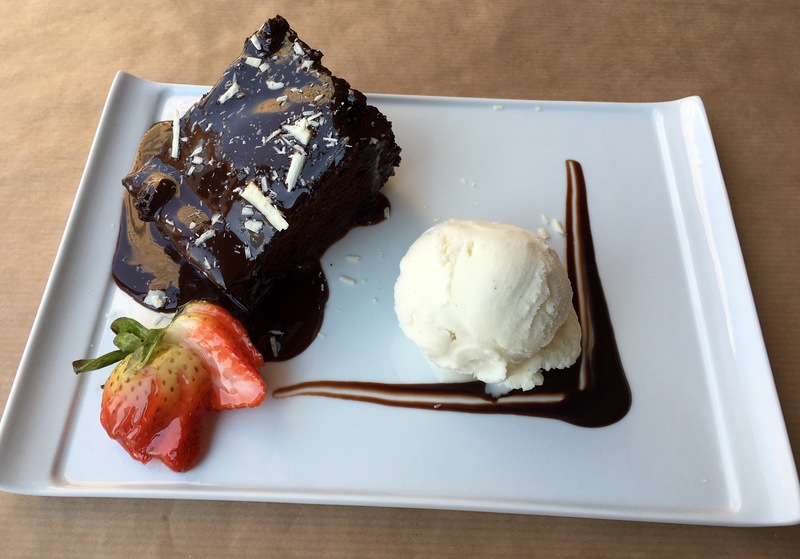 It is the Greek chocolate cake. The cake was moist and rich. It was served with vanilla ice cream. It was incredibly delicious, just thinking about it makes me hungry. Labbys The Hellenic House serves excellent Greek food. The ambience is beautiful. The service is efficient and helpful. The traditional Greek music in the background was soothing. It is a complete Greek experience. Labbys The Hellenic House is worth visiting.